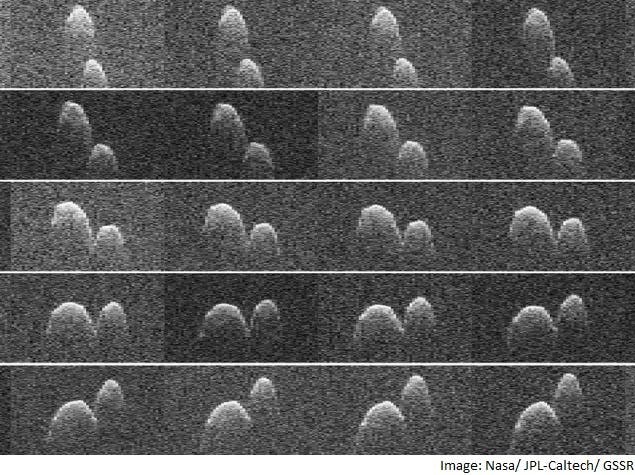 NASA scientists have taken grainy images of a peculiar asteroid nicknamed the “Space Peanut”. The asteroids measures 1.2 miles across and made its closest approach at 7.2 million kms from Earth – 19 times closer than the Moon. The asteroid’s scientific name is 1999 JD6 and is part of a surprisingly common class of asteroids – near Earth asteroids that are larger than 600 feet and are peanut-shaped. NASA has been paying more and more attention to this type of asteroids, because they are among the most likely to threaten our planet. NASA religiously monitors lose asteroid fly-bys but does not believe we are in danger of actually being hit by one of them for at least a few hundreds of years. Also, even if one asteroid was set to collide with Earth, there are things we could do. Astronomers are actually considering trapping an asteroid and bringing it safely to Earth, which is much more complicated than simply deflecting it. “We have the technologies to be able to do it, and the same technology is needed to capture asteroids,” said Ben Reed, who heads up the team that is developing NASA’s Asteroid Robotic Redirect Mission. To take these images, researchers paired Nasa’s Deep Space Network antenna at Goldstone, California with the National Science Foundation Green Bank Telescope in West Virginia. According to Marshall, a Cornell doctoral student in the field of astronomy, studying these asteroids is as important as it is interesting. “I’m interested in this particular asteroid because estimates of its size from previous observations – at infrared wavelengths – have not agreed. The radar data will allow us to conclusively resolve the mystery of its size to better understand this interesting little world”.